Agatha Christie: Evil Under the Sun is a video game released for the PC and Nintendo Wii, and is the third installment of The Adventure Company's Agatha Christie series, developed by AWE Productions, based on Agatha Christie's novel Evil Under the Sun. The PC version was released in 2007, and the Wii version one year later. Evil Under The Sun features Hercule Poirot as the protagonist, unlike the previous game in the series, Agatha Christie: Murder on the Orient Express, which had featured Poirot as a non-playable character. It also features numerous improvements and expanded gameplay elements, with a new inventory system, dialogue choices, and more environments. While players take the role of Poirot, they are actually playing as Captain Hastings playing as Poirot, in an interactive scenario designed by Poirot in order to allow his long-time friend a chance to solve the mystery in the way Poirot would. Reviews of Evil Under the Sun ranged from mixed to negative. GameRankings and Metacritic gave it a score of 69% and 66 out of 100 for the PC version, and 49% and 46 out of 100 for the Wii version. 1 2 "Agatha Christie: Evil Under the Sun Release Information for Wii". GameFAQs. Retrieved September 29, 2014. ↑ "Evil Under the Sun - The Next PC Game in the Agatha Christie Series" (PDF). The Adventure Company. March 22, 2007. Archived from the original (PDF) on September 28, 2007. Retrieved June 19, 2007. 1 2 3 Emma Boyes (March 22, 2007). "Poirot investigates again on PC". GameSpot. Retrieved September 29, 2014. 1 2 Matthew Morrison (October 25, 2007). "Review: Agatha Christie: Evil Under the Sun". Game Almighty. Retrieved October 31, 2007. ↑ Rob Michaud (December 5, 2007). "Agatha Christie: Evil Under the Sun review (PC)". Adventure Gamers. Retrieved September 29, 2014. ↑ Brett Todd (October 22, 2007). "Agatha Christie: Evil Under the Sun Review (PC)". GameSpot. Retrieved September 29, 2014. ↑ Anise Hollingshead (November 1, 2007). "Agatha Christie: Evil Under the Sun - PC - Review". GameZone. Archived from the original on March 10, 2009. Retrieved September 29, 2014. ↑ Emily Balistrieri (October 22, 2007). "Agatha Christie Evil Under the Sun Review (PC)". IGN. Retrieved September 29, 2014. ↑ Aaron Thornton (December 19, 2008). "Agatha Christie: Evil Under the Sun Review (Wii)". IGN. Retrieved September 29, 2014. ↑ "Agatha Christie: Evil Under the Sun Wii Review". Official Nintendo Magazine: 84. February 2009. ↑ "Agatha Christie: Evil Under the Sun". PC Gamer: 80. January 2008. 1 2 "Agatha Christie: Evil Under the Sun for PC". GameRankings. Retrieved September 29, 2014. 1 2 "Agatha Christie: Evil Under the Sun for Wii". GameRankings. Retrieved September 29, 2014. 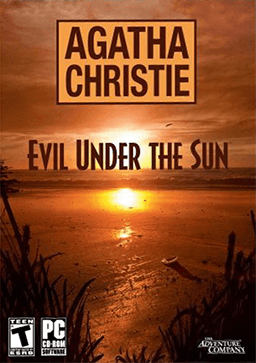 1 2 "Agatha Christie: Evil Under the Sun for PC Reviews". Metacritic. Retrieved September 29, 2014. 1 2 "Agatha Christie: Evil Under the Sun for Wii Reviews". Metacritic. Retrieved September 29, 2014.